Jean Baptiste Vuillaume was one of the most prominent and accomplished violinmakers, dealers, and innovators of the 19th century. He was born into an old violinmaking family in Mirecourt. After his initial training by his father, Vuillaume moved to Paris in 1818 and apprenticed with François Chanot. In 1821, he began an affiliation with Simon Lété which ended in 1827 when Vuillaume opened his own shop in Paris. He won the silver medal at the Paris Exhibition of 1827, the first of many medals that he was awarded during his long and distinguished career. Vuillaume was responsible for bringing many extraordinary Cremonese instruments from Italy to Paris, often from the celebrated collection of Luigi Tarisio. 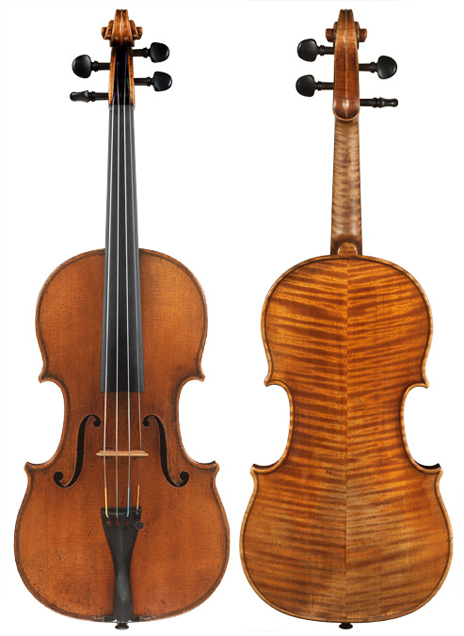 Having had the opportunity to study so many of the nest examples, Vuillaume was able to develop successful Stradivari, Guarneri del Gesù, Amati, and Maggini models in response to the demand at the time for violins in the style of old Italian instruments. Vuillaume’s models were, from the very beginning, acquired by the foremost musicians. His was soon the leading shop in Paris and by 1850, was the first shop in Europe doing business in every country. Vuillaume’s instruments are still very highly regarded by professionals today. This superb Stradivari model is tonally broad, even, and responsive with powerful projection and would be an ideal musical partner for all types of playing.